Made of high quality alloy, durable and useful. The skate bushing will get abrasion after long time use, in order to keep the wheel bearing smoothly, it's necessary to change the bearing bushing regularly. These are basic replacement bushings for most skates. Bearing spacers are designed to create a nice smooth axel spin and will help prevent your bearings from collapsing, and the bearing will be motionless without the bushing. These spacers will fit all standard skate wheels. Fashion cherry blossom pattern and frosted surface. 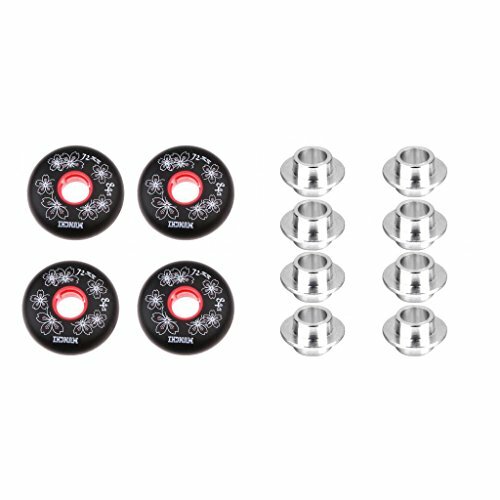 Use for replacing the old or the broken one, provide a faster, smoother, safer and more reliability skating. 84A high-elastic and abrasion resistance with good grip, suit for a variety of players. It is the hardest inline hockey wheel, it is best suited for street hockey on asphalt and gritty concrete. Above the Chinese Size of 40 wheel shoes (including size 40), the middle of the two wheels are 80mm, the end of the both sides are 76mm.